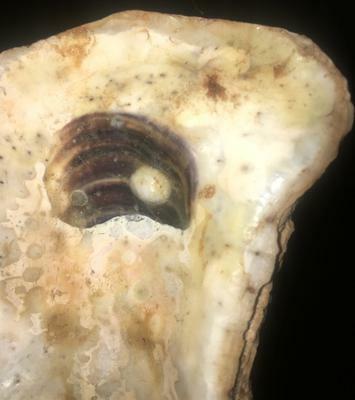 Pearl found in old Oyster Shell - fossil pearl? Is this a fossil pearl? I am unsure if this would be the right forum. I inherited an old seashell collection from my Grandmother when she was still living (as I LOVE seashells, the ocean, and everything about it). There is one very interesting piece that I need help identifying. 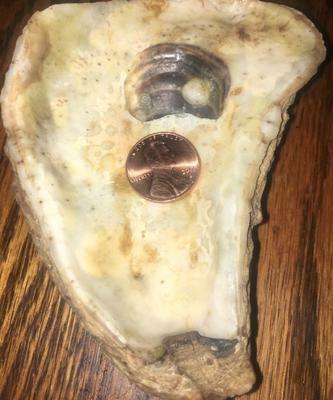 It is a very old Oyster shell with a pearl embedded in it. I remember her telling me when I was little that it was very special. Please review the pictures. It is an extremely old shell, but what is weird to me is the inside of it. The layer around the pearl is still what I would expect to see today in a shell, but the rest of inside of the shell is not. Please forgive me for not being knowledgeable or sounding like an idiot here. Ha! 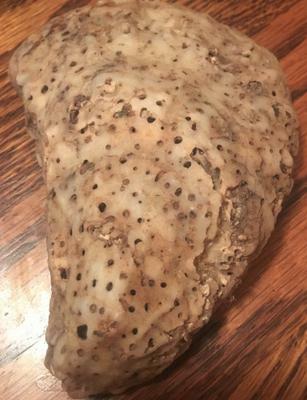 I think it may have been found along the Texas Gulf but I am not certain about that. Heck, it could be California as that are the only two coastlines she ever traveled to. Would you consider this as a fossil pearl, or no? 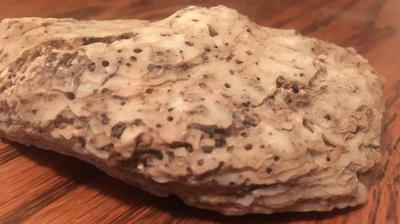 Comments for Pearl found in old Oyster Shell - fossil pearl? It's unclear to me what the darkish section is around the pearl but it does certainly look like a pearl embedded there. It would be for sure classified as a blister pearl. As far as being a fossil pearl, I'm not sure about that. Yes, I agree, it is a very special piece and a treasure to be sure! It's a lovely gift from your grandmother and it was good of her to point out its specialness!